Well after about one month of no blogging, and taking a break from it, I had to come back to my old life simply because I am starting to miss it. I apologize for disappearing this way, without really no explanation. I want to send a big thanks to everyone who sent me wonderful little message asking how I was doing. That really brightened my dark days. There are truly wonderful bloggers out there whose kindness really touched me. One more time, Merci infiniment to all of you who got in touch with me and to all of you who kept reading my old posts. I hope no one thought I was some kind of lunatic (in French lunatique, means moody) who just disappears without leaving any trace. I felt somehow overwhelmed and unmotivated and busy with some other projects and just wanted to take a little break from the blog world. I hope everyone out there is doing marvelously, happy and in good spirit! I have always loved octopus, but it seems like little by little, I am really getting addicted to it. Isn’t this a weird addiction? Oh well, I think we all have a weird attachment to something in particular, don’t you think? I got somehow inspired by the Japanese cooked spinach dish, I believe it’s called ohitashi, but here I used chards instead. Chards have a stronger flavor than spinach but I really like them with octopus. 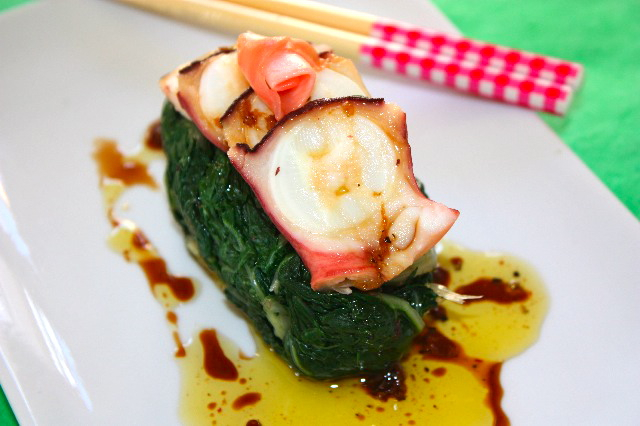 The dense octopus meat goes perfectly well with the leafy texture and flavor of the chards. The whole dish being enhanced with a citrussy and ginger dressing. 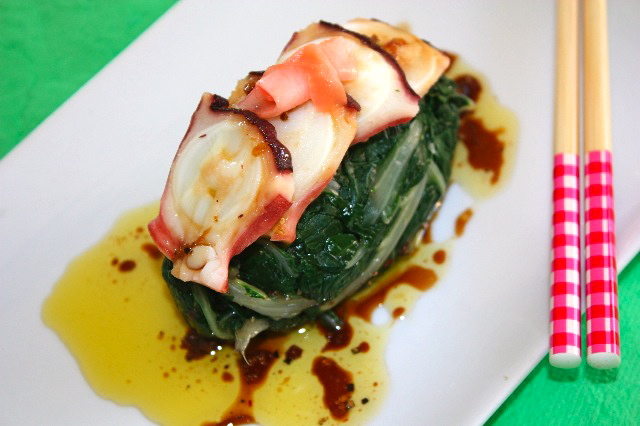 This is a simple dish, with true flavors that would be perfect as a seafood tapas. The Chinese market I go to sometimes, have cut and pre-cooked octopus, so you don’t have to buy a whole one, that is perfect for small portions. Bring salted water to a boil in a large pot. Remove stems from chards. Add chards to boiling water. Cook for about 7 minutes, then drain and let it cool. When completely cooled, squeeze extra water with your hands and form a small oval shape ball. Cook octopus until soft (about one and a half hours) or if you use pre-cooked octopus, just place it in boiling water and let it cook for about 15 minutes. Slice each tentacle in about 2mm thick slice and place it on top of each chard ball. 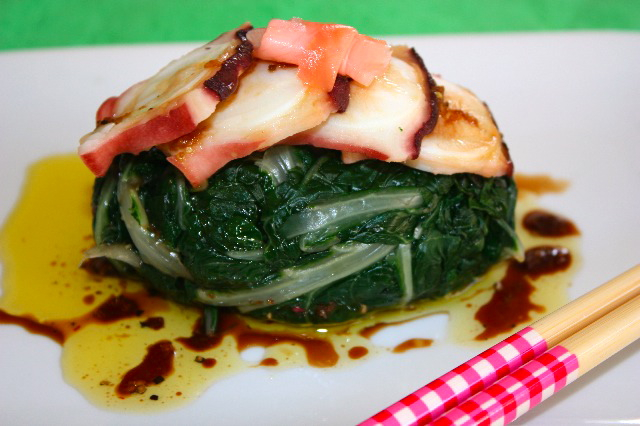 Combine all the vinaigrette ingredients together, mix well and spoon some of it on top of the octopus and around the spinach. This entry was posted by silvia on October 26, 2010 at 1:06 am, and is filed under Appetizers, Fish/Seafood. Follow any responses to this post through RSS 2.0.You can leave a response or trackback from your own site. Yay, so glad you’re back! I missed your beautiful posts but I just thought you were busy with life. I love the simplicity of this dish. Since I’m so familiar with its ingredients, I can almost taste the vinaigrette and how lovely it would be with the chard and octopus. Welcome back to the blog world! Welcome back! And what a way to come back. Love octopus! Welcome back, Silvia. Miss you a lot! Haha…. you’re welcoming us with this little creature! Simply gorgeous. Hope you’re having a good day. Welcome back! Glad to have you back. Was wondering where you were. Good to have a break at times. Yay~ You’re back! It’s so good to here from you. This is a prefect post-hibernation dish–light and bright! I’m truly glad you are feeling better! Tes messages m’ont un peu manqué! J’aime beaucoup ton blogue. Il est toutefois vrai que ça fait du bien de faire des pauses dans la vie. C’est vrai que la poulpe est une drôle d’obsession! N’empêche, nous avons chacun nos trucs! Cette recette a l’air vraiment bonne! Elle voudrait bien voir une recette a base de potiron, son obsession. I have missed your posts. I hope you’re feeling better. For some reason I am intimidated in trying octopus, but your dish looks very appetizing. Oh I bet this is good. And it isn’t wrong to be addicted to octopus, it is wrong for those who aren’t. Haven’t seen you in a while and now octopus! I love octopus and unfortunately it isn’t easy (impossible) to find up here in Sonoma. Great dish and great to see you again. I have missed you! And what a wonderful way to come back to us. Such a beautiful and creative recipe. I have never tried octopus before, but after hearing your thoughts, I’m eager to give it a try! Echoing the sentiments of all the previous comments, a big welcome back:) You were missed, thanks for sharing such a wonderful and creative dish for octopus, take care and hope to see more of your posts in the coming months. This looks lovely – I really love octopus as well! welcome back – we missed you! wonderful way to celebrate coming back. 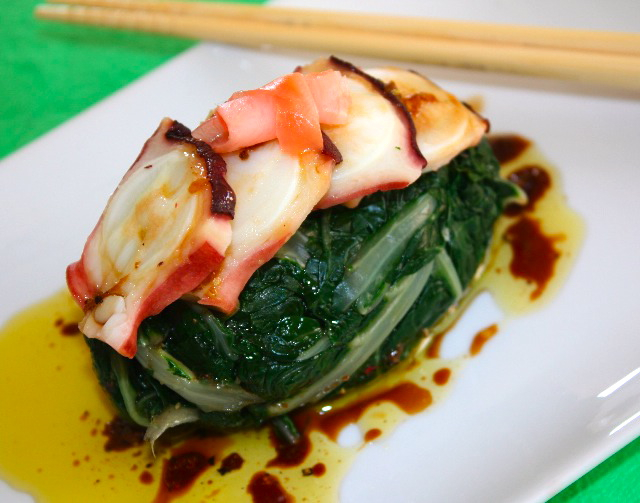 a tender octopus makes a delicious dish – and yours looks delectable!